I was blown away entirely by that show (at a very young age) and have been a big Flo and Eddie fan (as well as a major devotee of Mull's comedy) ever since. 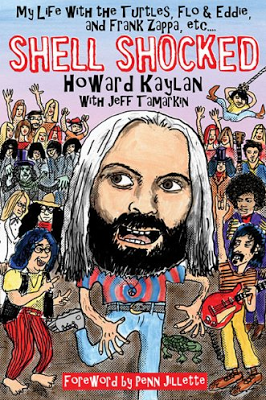 Thus I was quite pleased to recently have the opportunity, on the evening of Howard's signing of his thoroughly entertaining, anecdote-filled, new autobiography Shell Shocked at the Morrison Hotel gallery in Soho, NYC, to speak with Howard for a full 90 minutes (it was actually close to two hours, but the cameras were only on for 100 minutes, so why split hairs?). It was a delight to find out that he's as funny and articulate offstage as he is on. The man has a LOT of stories to tell, and tell them he does in Shell Shocked (that sports a cover illustration by Cal Schenkel). I take particular pleasure, though, in the moments where I got him to tell tales that are not included in the book. For instance, the two items below, a wonderful account of time spent (on plenty of acid) with a young Warren Zevon, and Howard's account of his meeting with his TV hero Soupy Sales and their subsequent friendship (which involved plenty of laughter and, yes, the occasional partaking of certain “substances”). And a nice chunk of our talk, wholly devoted to the subject of the one and only Soupy!!! I am continually busy with Funhouse activity of one kind or another, but one of the greatest joys is hanging out with people whose work I've enjoyed for years. 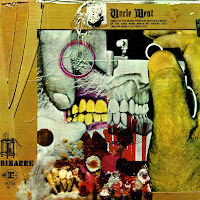 In this instance, a signing by Howard Kaylan (more on him in a minute) of his new autobio Shell Shocked at the Morrison Hotel gallery in Soho, NYC, afforded me the opportunity to speak with Cal Schenkel, the artist who is best known for his mind-altering album cover art for Frank Zappa and others. [Please read part one first. Exploring a blog is like watching time move backward very, very slowly....] I was surprised at how little “primo” Jonathan was on YouTube (aside from the few Paar clips). But this clip from an unlikely source, the Dean Martin roast for Pallie Frank, actually perfectly highlights what Jonathan did best. 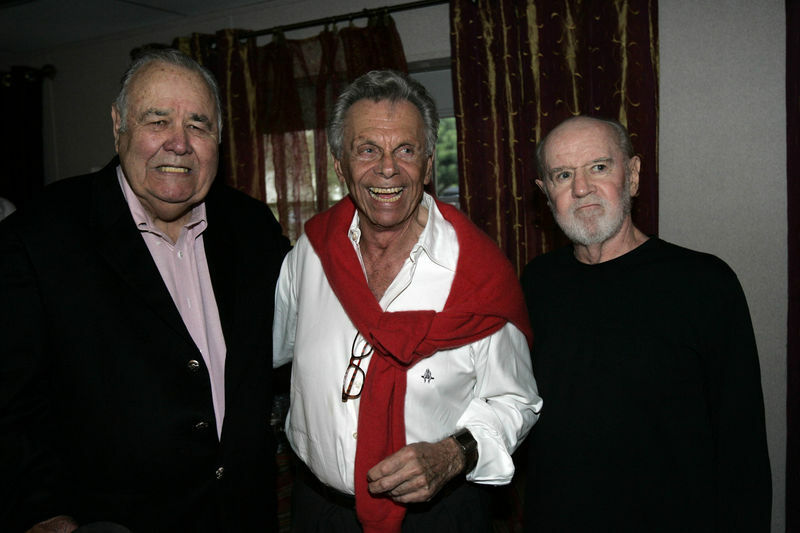 These roasts were “canned” events where the panelists read scripted jokes; the only two people who were “allowed” to ad-lib were Don Rickles (who is another force of nature, but a very different type of standup) and Jonathan. I’m not sure how many of the panelists were even present for Jon’s performance, since it has been revealed by both Rickles and Bob Newhart that the roasts were shot in “pieces” (for instance, Orson Welles would come in and do several “poems” and reaction shots for a bunch of the shows at once). 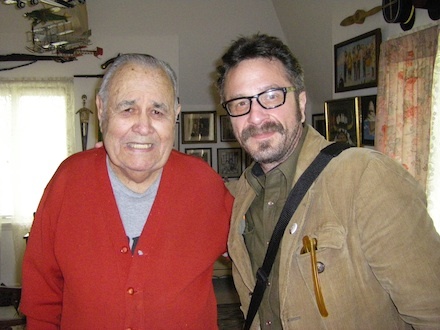 What matters here is the directions that Jonthan takes, and the fact that he is genuinely killing Dean and Frank (sure, Dean laughed at just about anything on his show — including the dreaded Foster Brooks — but here he looks like he's really amused). As noted, the crop of Winters' clips on YouTube is very disappointing, in that it contained no examples of his work on Steve Allen's shows, only one skit (no standup) from the Andy Williams series, and one sole clip from his many years on Carson (where he's NOT playing a character). There are no clips from the many weekly shows he hosted over the years, and only one LP cut. The single rarest thing is a fascinating-if-you-like-early-TV failed game show pilot called “Pass the Line” from 1954 (warning: Jon isn't funny at all and the game's concept is ponderously slow). Somewhere along the way, producers realized that the best set-up for a Winters spot would be to put him in a set filled with wigs and hats and have him just go with the flow. One of the earliest instances of this was on a 1963 special with guest star Art Carney, which the producers clearly edited; George Schlatter talks about the show, which was being prepped when the news that JFK had been assassinated came through, here. Winters was so overpowering you rarely saw him work with other comedians, but here he is with Mort Sahl playing his straight man (and some other comedian watching TV), in a 1986 cable special, and with Peter Ustinov (and John Astin!) in the cute but not-hysterical film Viva Max. The most interesting rarity to be found “hidden in plain sight” is the entirety of the 1959 Motorola LP “Progress in Sound/Magic Moments in Music,” which was given to customers who bought a Motorola record player. 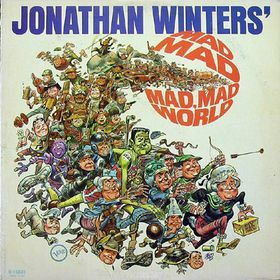 The first side of the LP features that inevitable ping-pong game between the left and right channels, but the second side contains interview with Jonathan in character (as a British hunter, Maude Frickert, and a bragging businessman). Now a short tangent about the serious side of Winters (more brilliantly funny stuff below this, for you impatient types). Unlike most of his fellow standups, it didn't seem like Jonathan sought out a serious acting career. His two best-known films are It’s a Mad, Mad, Mad, Mad World, World (which he literally steals in a famous scene set in his character’s gas station) and, for aficionados, The Loved One (1965). Those who have seen items like the unbelievably poorly paced Oh Dad, Poor Dad, Mama’s Hung You in the Closet and I’m Feelin’ So Sad have seen Jon’s talent squandered on a massive level. He did have a very serious side, which came out in interviews and some of the work he chose in the last few years. One quite sweet inclusion in one of the shows he hosted was this little segment about his family, about whom we heard very little (aside from discussing his breakdowns and time “inside,” Winters was a very private man, to his credit). 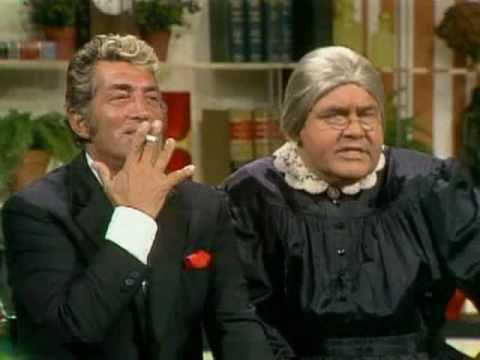 Back to comedy: One of the best sources of full-blown Winters madness are his guest appearances on The Dean Martin Show. 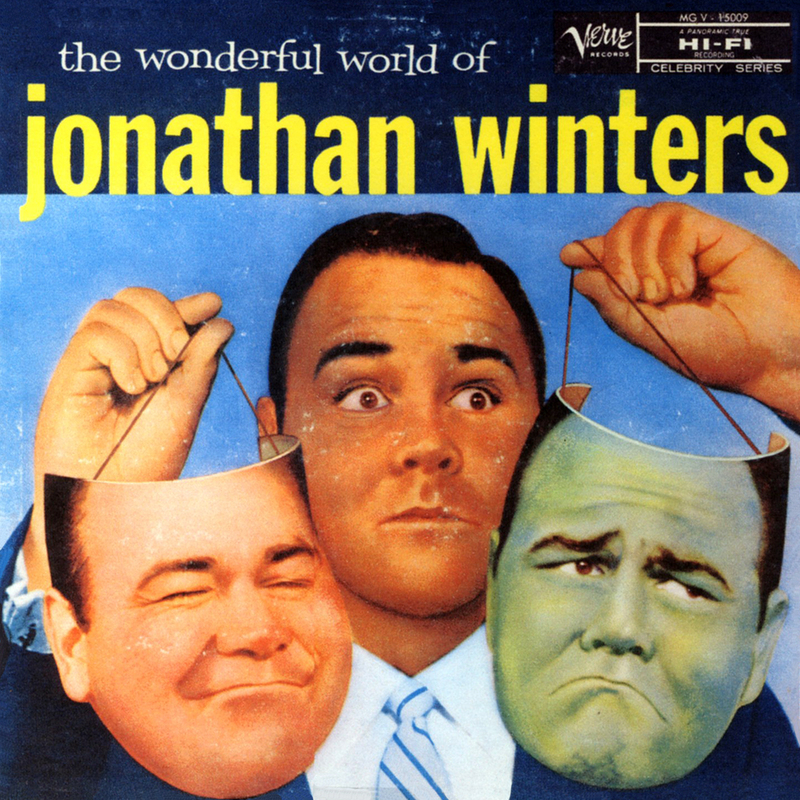 Perhaps it was producer Greg Garrison’s wise idea to let Jonathan loose and then just edit his improvs down to an airable length, or maybe it was just host Dino’s breezy “let’s not take this thing too seriously” attitude, but Winters shone with Dean, as he had with the first three hosts of Tonight. Here he does old Maude Frickert, uttering her catchphrase, “all over my bodeeee” A real piece of unscripted weirdness takes place here when he assumes the role of an annoying passenger on an airplane (replete with beautifully weird riffs that aren’t meant to be openly funny, as when he talks about his brother who lives in the basement and rolls his cigars). I was mesmerized by the roasts on Dino’s show as a kid. Now I’m still fascinated by the mix of un-p.c. humor and celebs reading off of cue cards, but the two comedians who ALWAYS “killed” on that show were the only two who ad-libbed their segments, namely Don Rickles and Jonathan. Here Maudie Frickert mocks Ronald Reagan’s hair dye. And, as “Willis Mumford,” a country boy, he gets to crack up roastee Johnny Carson. 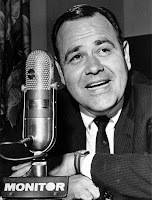 In recent years, despite having health problems, Winters continued to appear on talk shows. Bonnie Hunt wisely had him come out in character, something most contemporary hosts are scared of — with talk shows being so tightly constructed these days, there is no time for anything that didn't come out of the writers’ room. He did get off a few lines (out of character) to Craig Ferguson about his ill wife and how he likes to scare her from time to time. 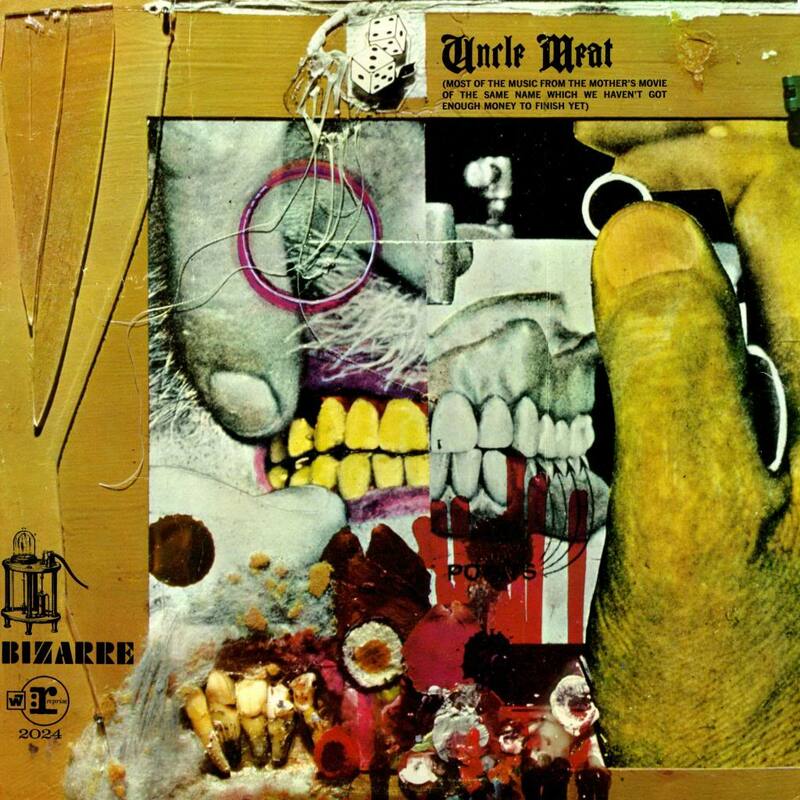 That is what is so incredibly impressive about Jonathan’s art (and his ad-libbing did move from standard comedy into sheer artistry): the fact that he created very bizarre images with his choices of words and sounds. That isn’t something that is tolerated on late night talk shows these days, though — on a guest appearance with Jimmy Kimmel a few years back he showed up as a deranged scout master who dressed his little boy charges as little girls. The bit was not hysterically funny, but Winters' word-paintings got stranger and stranger (and more and more brilliant) until he finally got to a description of a flood that came through the woods and washed all their little dresses downstream. The piece was a top-notch example of Winters’ talent, but all Kimmel could do was interrupt him, ask him “Can I speak with Jonathan?” and then move on to quiz him about his work on other shows, from Paar and Carson to Dean Martin. Rather than have a bona fide piece of Winters’ weirdness on his show, Jimmy wanted to reconnect to the old weirdness and hear a bunch of reminiscences. Thus I give full kudos to Marc Maron, whose podcast “WTF?” (as noted here before) is an odd amalgam of interview show and therapy session. As he so often does in his chats, Marc's interview with Jonathan got the latter to go to “the dark places” in his past: the fact that his parents never were affectionate to him and hated his work as a comedian. The other sad topics tackled included Jon’s time “in” and the clever ruse that at one point helped him to escape having electro-shock therapy. However (as Professor Irwin is apt to say), Marc also prodded Jon to dip into his stash of characters and, unlike Kimmel, allowed him to come up with little slices of genius. The whole interview is worth your time and attention, but Jon begins “winging it” (as he often put it) at the 55:00 mark. A truly BRILLIANT bit of comedy occurs at 1:01, as he plays out a therapy session in which the therapist is fed up with his spineless patient and begins instructing him on ways to off himself. Remember, at this point Winters is 85 and still functioning on all cylinders. You can listen to the interview here (caution: at some point this interview will be “locked up” for pay, as Marc does with all his older shows). 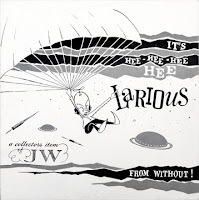 The routine that Jon did on the Maron podcast is a fascinating echo of Winters' “underside,” which is heard at length on the privately-pressed 10” record called It's Hee-Hee-Hee Hee Larious (an anonymous slab of white-labelled vinyl that is credited only to "J.W."). The original record is indeed a rarity, since presumably it was made to be given away as a gift to Jonathan's friends. It connects him with the other radical "black humorists" of his day; if you want proof he was not only friends with the Vegas folk, you merely need to check out the Lenny Bruce CD box set Let the Buyer Beware, on which you can hear Lenny doing an early show strictly for the benefit of Jonathan, who was playing in the same town (and evidently had told Lenny he wanted to see his show, but was doing his own at the same time). On the Maron interview, Winters notes that he knew Lenny professionally, but was "running buddies" with the inimitable (and equally irreplaceable) Lord Buckley! On that same note, here's a very intriguing slice of standup in which Jon seems pissed off about something. The poster doesn't note what show it came from, but it is from 1980 (he timestamps it by mentioning that he's been married 32 years). He really goes to town here, free-associating about gas stations, going to dinner parties, and generally making bitter fun of his marriage (not his usual sort of material – and of course he did remain married to his one and only wife for another 29 years!). Showing that he had indeed lost none of his edge in his final years, here is an outtake from the mockumentary Certifiably Jonathan in which he riffs a Western poker game, and below is a radically weird and uncensored retelling of Little Red Riding Hood. This definitely fits in the “Hee-Hee-Hee Hee Larious” mode, and I'm very glad the filmmakers caught it on video. The guy was 85 years old and his mind was as sharp (and blissfully strange) as ever. And, because I'm sure he'd want this aspect of his public life emphasized, I link to his personal website where he displayed and sold his art, both paintings and sketches. Winters' mind is now silenced, but his imagination will live on for a long time to come. I want to slow down the production of obit posts here on the blog, but it is indeed hard not to rhapsodize about Jonathan Winters. 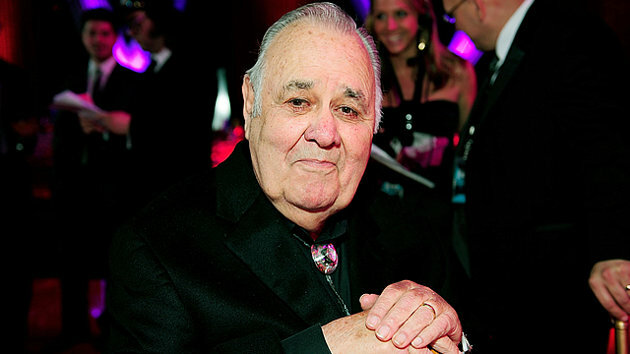 He was, simply put, a complete original, a comedian who was unlike anyone else in the business. Sure, it's easy to see bits of Jonathan in later standups, from George Carlin and Robin Williams to the dreaded “prop comics.” But he was the complete package – a comedian who created not only characters but ensembles, situations, and settings with a tone of voice, an odd gesture, a crazed expression. 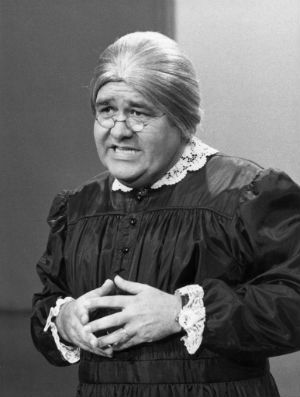 He was perhaps the truest improv comedian of all, a performer who was willing to fail and flounder at points only to produce a phrase or line that could utterly floor you. There are several reasons why Winters was so special. Perhaps the most important was that he was truly troubled in his personal life. His rapid-fire mind and ability to inhabit different characters at the drop of a hat was an immaculate talent, but it also indicated that his mind was indeed moving at a speed that few of us can recognize. 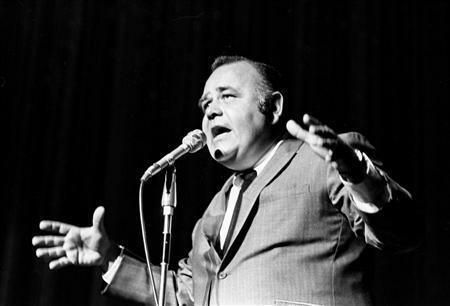 He ended up being institutionalized in 1959 for two weeks and then had another collapse in 1961 (that time he was “in” – he liked to joke in his act about the difference between “out” and “in” – for eight months). In this regard, Jonathan stands with only one other comedian who did literally suffer for his comic genius by having several mental breakdowns. That man was Spike Milligan, the immortal creator of The Goon Show and another indelibly original comedian. Both he and Winters were one of a kind and can never be replaced. 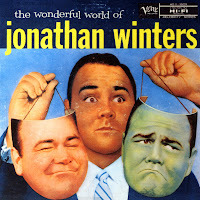 Winters was thus “a man apart” from his contemporaries – who ranged from the Vegas comedians (the Shecky Greenes and Buddy Hacketts) to the brilliant crop of standup satirists who emerged out of Chicago (Sahl, Berman, Nichols and May). He also was very different from his successors, who were not as plagued by their comic brilliance. Robin Williams might have had drug troubles over the years, but he always has been, at base level – despite the manic energy – a somewhat normal guy, as is evidenced by his impressive career as a dramatic actor. Jonathan was not “abnormal,” he was just very... different. He was blessed with a talent that allowed him to act out entire scenes — something comedians had done since vaudeville, but which he did with a manic energy and invention that was infectious. 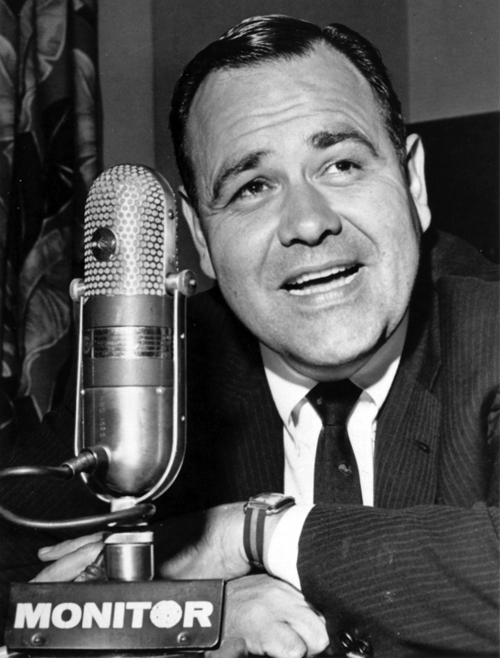 Winters’ standup was truly unpredictable. The nailed-down bits were captured in about a dozen LPs that are a lot of fun to listen to, but do lack that one key aspect: seeing Jonathan’s rubber face contort, watching him move from voice to voice (he did ethnic characters and celebrity impressions, but tended to focus on dimwitted American characters of all stripes). 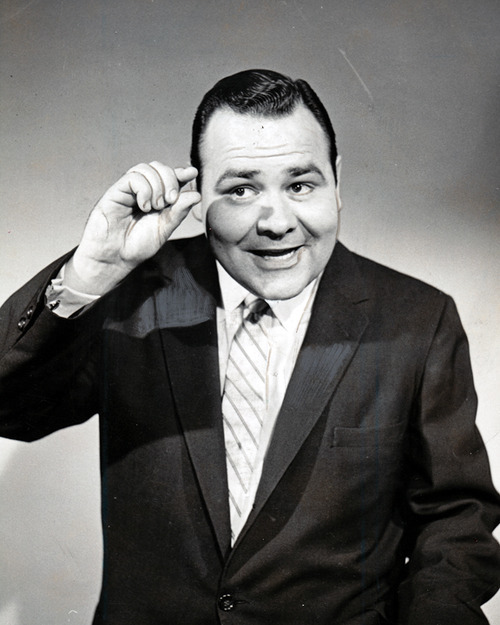 A bunch of his nightclub routines were movie spoofs, a standup staple throughout the Fifties and Sixties. If Winters did a Dracula sketch, though, he wouldn’t just do the requisite Lugosi impression — he’d do the castle door, the wind, the creaking coffin and staircases, and, natch, the “thup” noise of bats flying. Winters’ records are not well-represented on YouTube — perhaps because most fans remember his visual bits the best. 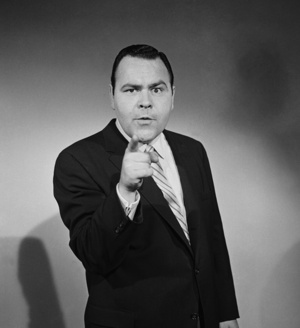 However, they can be heard on the private research blog Vintage Standup Comedy, which has a public “mirror” site here. 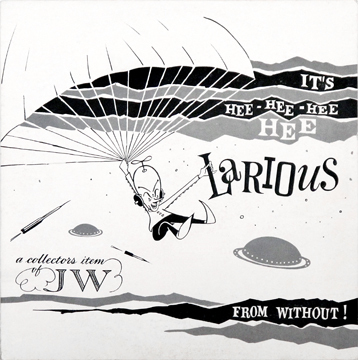 A short bit of chronology is necessary for those who don’t know where Jonathan “came from”: a native of Dayton, Ohio, he followed service in the Marine Corps during WWII (as an aircraft gunner) by becoming a student of cartooning at the Dayton Art Institute. There he met his wife Eileen, who was indisputably the most important person in his life (they remained married for 61 years until her death in 2009). 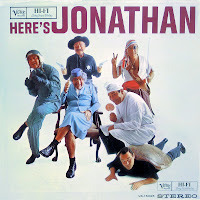 His entry into show business sounds like a tall tale, but Jonathan swore it was the truth: his art was going nowhere, so in 1948 his wife encouraged him to enter a local talent contest so he could replace a lost wristwatch. He won the contest and shortly thereafter became a disc jockey. Instead of simply playing records and giving the time/temperature/traffic, he began interspersing his “characters” on the air, and thus was born the Winters we all knew and loved. He came to NYC in 1953 and got his big break in television, depending on what obit you read, on either Chance of a Lifetime with Dennis James in 1954, Arthur Godfrey's Talent Scouts, or Alistair Cooke’s Sunday morning program Omnibus. He soon became a regular guest on variety and talk shows. Winters’ career was sidelined for a short time by his breakdowns in ’59 and ’61, but he returned with more frantic energy than ever shortly thereafter. I will move onto the clips here, but must lastly mention what was my single favorite thing about Jonathan: the fact that his improv was 100% legit (as opposed to the improv troupes that move immediately toward material they’ve prepared and performed before). 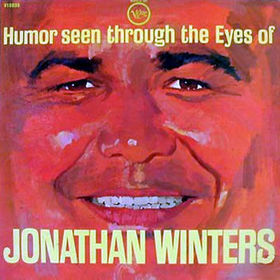 Winters impresses precisely because of the “gaps” in his bits, the moments where he’s not as funny. This was evident in the longer guest shots he did for Paar and Carson, in which the host would allow him to simply ramble on in character, to the point where he would seem to have lost his energy — and then a brilliant line would appear (or a look, or an odd noise). It was this particular aspect of what Jonathan did that made him so incredibly unique, the fact that his improv was true ad-libbing, it went “up” and it went “down.” The fact that he recovered and would suddenly throw in something brilliantly funny was the essence of his art. The single best intro to Jonathan’s imagination is this mega-montage put together when he was presented with a Lifetime Achievement Award in 2003 at the now–defunct Orinda Film Festival in Ordina, Calif. The first part features Jon in a new interview saying the reason he improv’ed SO much was that “I get bored with my material.” This montage also includes him doing Maude Frickert and has one of the many “missing” (online) Andy Williams Show appearances, where he does the costumes-and-prop deal with Andy. Also included is the golden moment on Paar where he was presented with a simple stick and came up with a few minutes of material and several different characters. 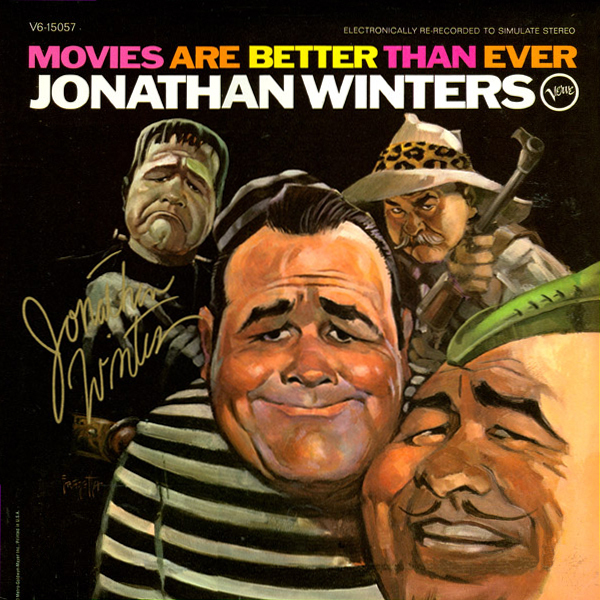 The second montage from the Orinda fest contains outtakes of Jon ad-libbing a commercial for eggs and a terrific segment from The Rosey Grier Show (1969-70), in which Jon does his “black voice.” Today this would be deemed un-p.c. and offensive, but Jon cast his net wide and did a host of voices, so he didn’t leave any group out. You’ll notice Rosey is cracking up, so what he’s doing is not offensive, it’s known as true improv. On the level of genius.